I am thrilled to be a stop on The Dyerville Tales blog tour. I am still reading the book so I didn't get a chance to review it in time for the blog tour, but I will entice you with one of the most musical, lilting first paragraphs of a book I've ever read. It is a mentor text in every sense of the word. Some tales are worth telling. Of all the children living in the Obern House Orphanage, none knew this more than young Vincent Elgin, he of the fair skin and the sad eyes, the disheveled hair and the honest smile. The poor boy arrived at his new home knowing full well what could be found in a tale. He was sure of it, as sure as the sun's rise each morning, as definite as the delicate fall leaves onto the crisp grass every autumn. In the lonely days of his life spent within these aged walls, of which the mice had uncontested rule, it was what kept him looking out the filthy attic window for hours at a time, day or night, out at the vast sprawl of colorful land stretching and sloping for miles on end, out at the distant houses and buildings and people populating almost every inch in sight, at the cars zooming by, tearing up asphalt and ripping through deep puddling reflecting the cloud-cluttered sky, at life in full swing under the steady and sweltering sun or cool gaze of a pale moon. It was what kept him peering out past the rusting orphanage gates while the other children played in the yard behind him, the house up on its steep hill looming menacingly over them all. It was what kept dreams from becoming nightmares. It was what kept despair out. 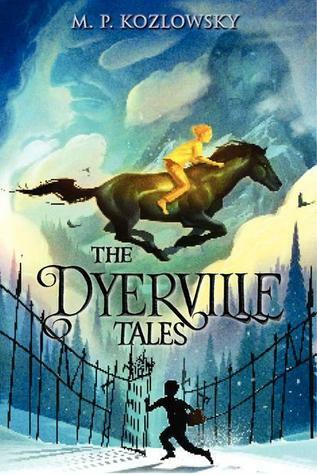 One winner will receive a signed finished copy of The Dyerville Tales by M.P. Kozlowsky! Thanks to Walden Pond Press for sponsoring this giveaway.